While both Trello and Jira are the most widely used project management tools out there, they have some key differences that effectively distinguish one from the other. Project management tools aid individuals or teams in organizing and managing tasks and projects effectively. Project management software not only helps you plan and handle your projects but all aspects of the project management process. Communication is the key to an efficient teamwork and a team can only collaborate effectively through good communication. To keep the entire team together in loop and in sync at all times during a project, a centralized platform is required where they will coordinate effectively with each other to manage the workload and simplify the process as a whole. Trello and Jira are the two most popular and major project management tools and share a common audience, but they have their differences as well. Trello is a free, cloud-based project management software released by Fog Creek in 2011 and later acquired by Australian software company Atlassian in 2017. It’s a collaboration tool that allows you to manage and track your work and collaborate with different users at the same time using boards, lists, and cards. It not only helps you keep track of everything to the minute of details but also helps you organize projects regardless of the size. It basically keeps everything organized and put them on boards so that anyone can coordinate and collaborate with what’s going on and where the project’s heading. Jira is one of the most popular project management and issue-tracking software developed by Atlassian to promote collaboration on an enterprise-level. It is specifically designed to serve Agile software development teams for managing projects and tasks using Agile to make them better at anticipating and handling changes. It’s one of the three products in the Jira product family, along with Jira Service Desk and Jira Core. It’s one of the widely used issue tracking and bug tracking software used by developers and technical support teams to get desired results faster and efficiently. Trello is a free, easy-to-use project management tool released by the Fog Creek founder Joel Spolsky at a TechCrunch Disrupt event in 2011. The organization has found great success in the last couple of years with over 19 million users worldwide and was recently acquired by the Sydney-based software company Atlassian in 2017. Jira, on the other hand, is the number #1 project and issue management tool developed by Atlassian that helps individuals and teams manage, plan, and track their work to better coordinate with the team and manage the workflow. Although, both project management tools provide a wealth of features to aid in project management, the difference lies in how the two systems are deployed. Trello is only available as cloud-hosted software meaning all the data is hosted on the vendor’s servers and it keeps everything in the cloud. 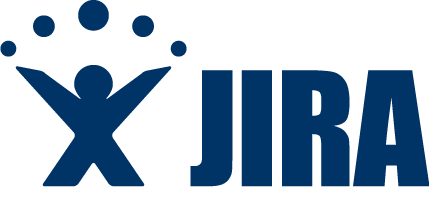 Jira, on the other hand, is available as both cloud-hosted service and as on-premise project management tool meaning it also offers an on-premise solution to host data on computers on the premises rather than using a cloud. The software is installed locally on company’s own computers and servers. The basic version of Trello is free which gives you free access to all project management features such as the ability to create unlimited number of boards, create lists, add members, and upload attachments and everything in between. You can also invite as many people to your board for free. Trello’s Business Class offers everything the free version offers and more including app integration, unlimited Power-Ups and more with a subscription fee of $9.99 per user per month. Trello’s Enterprise edition is for large companies and organizations and is chargeable at $20.83 per user per month. The pricing of Jira makes it ideal for use for small teams and scalable enough for large enterprises and businesses. Based on the size of the team, you pay a flat rate each month rather than paying on a per-user basis. The pricing model starts at $10 per month for small teams up to 10 users and it varies as the team size increases. Trello is the most simplified project management tool where teams and individuals can collaborate effectively on tasks and projects at hand. It’s also one of the easiest platforms to work on, thanks to the concept of boards, lists, and cards which are suited for any task from building a small startup to managing big projects, but the only downside, it lacks pre-built workflows. Jira, on the other hand, takes a whole new approach when it comes to task management and it comes pre-built with scrum and kanban workflows plus it also allows you to create your own custom workflows. Although both are efficient, easy-to-use project management tools, they have their fair share of differences. The key difference is the way they are deployed. While Trello is only cloud-based, Jira is available both as cloud-based sand on-premise service. In a nutshell, if you’re looking to manage small to mid-sized software team, you might end up using Trello as it’s a simple tool that aids in project collaboration and management. Jira, on the other hand, is a more robust, fully-functional platform with enterprise-level capabilities to handle large enterprises to serve higher needs. Jira is your go-to project management tool for large enterprises and teams. Sagar Khillar. 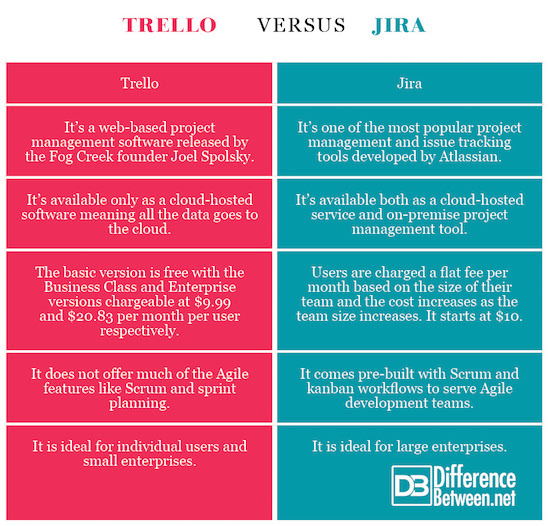 "Difference Between Trello and Jira." DifferenceBetween.net. July 23, 2018 < http://www.differencebetween.net/technology/difference-between-trello-and-jira/ >.